Liverpool manager Rafael Benitez says he feels sorry for the club's fans amid their woeful recent run of form. The Reds were dumped out of the FA Cup at home to Reading on Wednesday, are already out of the Champions League and lie only seventh in the Premier League. Benitez, reading from a sheet of paper, said: "We are not playing well and everyone here feels sorry for our fans. "But things can change in football and we have confidence that we can improve, starting with Stoke on Saturday." It is just over a year since Benitez's infamous outburst against Manchester United manager Sir Alex Ferguson, when Liverpool were top of the Premier League. In January 2009, the Spaniard started a news conference by pulling a sheet of paper out of his pocket and reading out a list of accusations about Ferguson's conduct regarding referees, the FA's Respect campaign and fixture lists. They went on to finish second behind United and have endured a torrid season this time around, with many fans and Reds legends suggesting Benitez should have been sacked after defeat to Reading. But Benitez, seemingly parodying his performance from last year, again pulled a sheet of paper from his pocket during Friday's news conference ahead of the Stoke game on Saturday and admitted it is a difficult time for the club. "This is a bad moment, we are not doing well during the season and we know have to improve and we have the belief we can do it," added Benitez. "How can we improve? Winning on the pitch. How can we be sure we win on the pitch? By training well. "If I am worried about my position or the future of the club at this moment I will lose my focus. "Stoke is the most important game now and we have to prepare properly. I cannot be worried about the other things. My future is Stoke now." Can you accept Rafa's apology? And does he now have your full support for being such a gentleman? Benitez signed a new long-term contract at Liverpool last season and some newspapers have reported it could cost the club nearly £20m if they sack him. The former Valencia boss, who joined the Anfield club in the summer of 2004, will not quit. "It is true I like to do my best every time. If I decided to stay here and signed a five-year contract it is because I wanted to fight," said Benitez. "Things are not going well, we know, but if I waste my time talking about all these things all the time I will lose my focus and it will be worse and worse. "I don't need any assurances of anything. I promise you I am preparing for the next game and, in football, things can change the next week." And the Spaniard found an ally in Tottenham boss Harry Redknapp, whose side are themselves hoping to pip Liverpool to a top-four finish this season. 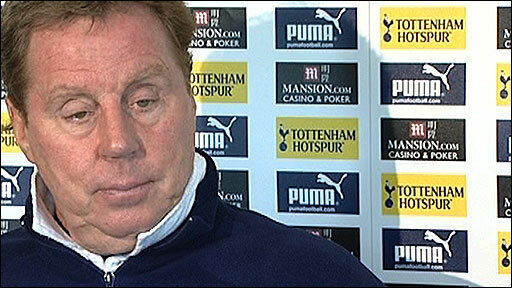 When asked about Benitez's situation, Redknapp replied: "The man's record is fantastic and he doesn't need advice off me. "Last year, Liverpool were fantastic and they're capable of being fantastic again and Benitez knows that - he's a top, top manager. "Sometimes it's a thin dividing line (between success and failure). Everybody has those spells, the bad spells. You have to be patient and let him turn it around. "When he gets everyone back fit they're capable of having a terrific run again for sure. Liverpool will always come back strong." Liverpool are desperate for a win at Stoke in the 1245 GMT kick-off on Saturday to boost their hopes of finishing in the top four and reaching next season's Champions League. Potters boss Tony Pulis says he is prepared for a Liverpool backlash after the storm of criticism that hit Benitez and his players following Wednesday's Cup loss. "I think Rafa's been a bit unlucky this season with injuries and loss of form of key players," said Pulis. "They will have been stung by the criticism and a backlash is what I'm sure Rafa will be hoping for. "Their players will be fired up, which will make it a more competitive and difficult game for us, and we have to be ready for that." Chelsea manager Carlo Ancelotti said he had no doubt Benitez was the best man for the Anfield job. "I consider Rafa Benitez to be one of the best coaches in the world," said the Italian. "He has done a fantastic job and he has the quality to continue to do that job." 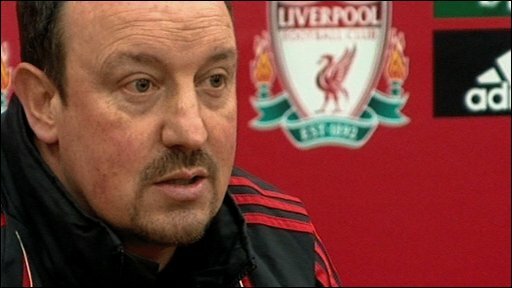 And former Liverpool midfielder, and three-time European Cup winner, Jimmy Case told BBC Radio Merseyside that it would be wrong for the Reds to part with Benitez now. "I think at this moment you have to stick with it and look towards the end of the season and reflect then," said Case. "I know that everything appears to be falling apart around our ears at the moment, in terms of going out of competitions, and it makes it worse with the Reading result. "There are fans who will continue to support the manager through thick and thin, and I think the majority of Liverpool supporters will do just that. "I think we need stability until the end of the season and see what unfolds then." Meanwhile, Liverpool winger Ryan Babel has revealed on his Twitter feed that he has been dropped from the squad for the visit to the Britannia Stadium. "When you have problems everyone has a different reaction," said Benitez. "It is more than just football; agents, money, TV, radios and internet everyone needs to talk - everyone has a Twitter or something like that. "It is impossible to stop people talking, it is not like in the past."